No home gym is complete without a set of weights. You can either find a complete set, or pick out individual weights based on what you plan on using them for. We’ll go over the different types of weights you can choose from, some of the styles you’ll come across, and then we’ll give our recommendations for the overall best value in each category. Through these recommendations, you’ll be able to pick the weights you need and put together a perfect set for yourself based on what you’ll actually use, therefore you’ll have the BEST home weight set. One of the pros of having a home gym vs going to a commercial gym is that you have full control over the equipment you want to use. From dumbbells, barbells, and even kettlebells… there are adjustable versions that allow you to change how much they weigh, and there are fixed weights where each piece weights a set amount. Adjustable is convenient because it allows you to get a lot more bang for your buck since each place you buy can be used for both dumbbells and barbells. Also, if you have a fixed weight 30lb dumbbell set, and you want to lift something heavier, you’ll need to buy an entirely new set of dumbbells. If you had adjustable weights instead, you could just add on an extra 10lb plate. Plates are usually made from metal, and sometimes have a coating on the exterior to make them less rigid. Cheaper ones can cost around $1 per pound, and higher-end plates can cost much more than that. Plates are placed on either end of a bar and are used to determine how much weight you’ll be attempting to lift. These consist of a small bar with weights on either side. Similar to dumbbells, but the bar is much longer and the weights are often heavier. They’re like cannonballs with handles, and there are a ton of great exercises you can do with them. This one simple weight can give you a full body workout while training both strength and cardio. Olympic bars and plates are 2 inches, whereas others are just 1 inch. It’s just a matter of matching the bar to the weight plates you buy. We’ve chosen two in this category, one for beginners who are looking for something basic, and one for people who want a higher-end experience. Either way, both of these options will have you picking up heavy things and putting them down, but if you’re looking to start with a higher max weight, and you’re all about the experience, you may want to seriously consider the Bowflex. This first set is made by AmazonBasics, so you know it’ll be solid without any extra frills. 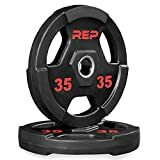 It comes with two bars, 38 pounds of weight in total, and twist-on stoppers (collars) to keep the weights in place, which are a lot better than some of the cheap plastic ones we’ve seen. Each bar weighs 3 pounds, and there are 4x 2.5lb plates, 4x 5lb plates, and the four collars which weigh .5lb each. 30 of the pounds from this 38 pound set are in the form of plates, so you can have one bar with 30 lbs + 3lbs for the bar + 1lb for the collars, allowing you to workout with 34lbs, or you can spread out the plates between both bars and end up with 19lbs in each hand. You can also buy additional plates, which really highlights the simplicity of something like this, compared to the Bowflex which you can’t really upgrade after the fact, mind you it’s a lot heavier to start with so you won’t really need to. These weights are adjustable from 5 – 52.5 lbs each, making the total weight between them over a hundred pounds. This is like having an entire wall full of sets of dumbbells climbing up in small increments (For the first 25lbs, they go up in increments of 2.5lbs), but without having to take up an entire wall and purchase a huge rack for all of them, not to mention spending thousands of dollars on each individual fixed weight dumbbell. 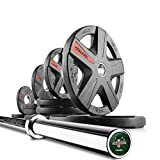 Granted, this set from Bowflex is a bit more expensive than buying regular plates and a bar would cost, but it’s pretty slick, much easier to adjust on the fly, and can be purchased along with a heavy-duty stand. It’s essentially like boiling down fifteen sets of weights into one set. 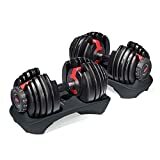 When you take the average price of decent quality weights of any type which can be around $1.25 – $1.60 per pound and consider the versatility of this Bowflex set and the features, the price doesn’t seem unreasonable at all. It’s a high-end piece of equipment, and it’s quite possibly the only set of dumbbells you’ll ever need. Includes the LUMBERJACK 7' Olympic Bar and a 155 lb. set of TEXAS STAR rubber coated Olympic plate weights: (2) 45 lb. (4) 10 lb. (4) 5 lb. and (2) 2.5 lb. plates. COLLARS NOT INCLUDED. The LUMBERJACK 7' Olympic bar is built for performance. The 28mm black manganese phosphate shaft of the LUMBERJACK has a semi aggressive knurling with dual knurling marks. Upgraded with brass bushings, the LUMBERJACK Olympic bar provides the perfect spin and is built to last. The smooth chrome sleeves ensure easy loading of plates while providing a superior feel. The TEXAS STAR Olympic plate weight's recessed 5 grip handles have spacious openings fitting comfortably in the hand while the stainless steel precision hub ensures a perfect fit and ease of loading. Olympic bars are wider than the regular kind, and require plates with larger holes. This particular bar from XMark, The Lumberjack, is a great choice for a home gym. You’re going to pay a bit of a premium for the quality here, but it’s well worth it once you’re at a point in your fitness journey that you’re looking to pick up an Olympic bar. Even if you’re just starting out, and don’t own any sets of weights yet, this is a great starting point. There are options available at Amazon to buy just the bar by itself, or to choose a number of different weight and plate configurations. The plates are great, they have handles so that they’re easier to load and unload from the bar, and this also allows you to do a number of other exercises with them, making them into versatile weights in their own right, while also allowing you to do all of the major lifts when they’re on the bar. This is a serious set for a serious lifter. Or a beginner who wants to dive right in with great equipment that will last them forever, as opposed to starting off with those rugged plastic plates that are filled with stone. Note: If you want a standard bar instead of an Olympic bar, this Cap bar (https://www.amazon.com/CAP-Barbell-Standard-1-inch-Chrome/dp/B002KLQJGG/ref=sr_1_5_acs_ac_2?ie=UTF8&qid=1546685444&sr=8-5-acs&keywords=barbell) isn’t perfect but it’ll get the job done at a considerably lower price point. It fits the smaller 1 inch plates, so if you’ve already got some of those kicking around, it can be an economical choice. If you’re planning on using adjustable dumbbells and barbells, it’s a good idea to stick with either 1 inch or Olympic sizes throughout, so that you only need to buy each size of plate one time. Once again, AmazonBasics is coming through with the unbeatable value for solid quality gear. These kettlebells have an enamel coating on them, they feel a lot nicer than the cast iron ones. If you’re going to be using them in your home, the enamel is a lot easier on the floors, especially if you’re on hardwood. If they’re for a garage or unfinished basement, you may want to opt for cast iron instead, since a rough floor could damage the enamel. 25 pounds is a good weight to start with if you’re new to kettlebells, you’ll still have trouble with many of the popular exercises at first. You could go for 30 or 35, too, those are both good starting weights. Anywhere in the 25-35 range will get the job done, based on your fitness level. If you think 25 or 35 pounds is too light, you’ll change your mind very early into a full kettlebell workout. This section is divided up into our choices for the best 1-inch plates, and also the best Olympic sized plates. The Olympic ones are going to be more expensive, and higher quality, more of a premium/enthusiast product, and the 1-inch plates are going to be chosen as a more budget-conscious option. Regardless of which one you go with, these are our top picks, so you can’t go wrong – it just comes down to what you’re in the market for. EASY TO LIFT AND CARRY: Comfortable triple-grip hand holds are standard on all plates over 5lbs for easy handling, loading and unloading. The recessed center reduces the risk of pinched fingers when you load the bar. More grip options make these great for plate-bearing exercises too. Add weight to your situps, low back extensions, overhead tricep work, you name it. DESIGNED FOR PERFORMANCE: Precision machined stainless steel inserts allow the weights to slide easily on and off without damaging your bar, and wont leave a sticky black mess. SATISFACTION GUARANTEED: You will LOVE your new plates or your money back. Rep Fitness is a full-service equipment company headquartered in Denver, Colorado. We carry a full line of strength and conditioning equipment including benches, barbells, dumbbells, racks, cardio equipment and more! These rubber coated Olympic plates from the brand Rep are excellent. They’re well made, with nice details like the stainless steel inserts to protect your bar. They have grips, and offer a great value compared to some of the wildly expensive Olympic plates out there, without having you make any sacrifices in terms of quality, durability, or functionality. These are the classic buck a pound plates, but they’re denser and infinitely more durable than the plastic ones filled with stone that you’ll often find at garage sales for cheap. There’s nothing fancy here, just old school bodybuilding essentials. Be careful, sometimes people will charge odd prices for certain sizes, so make sure you’re choosing the popular sizes and that the price is showing up somewhere around $1 per pound, give or take. These are thin and don’t take up a ton of space which makes them great for using with an adjustable dumbbell. Putting it all together, your weight set should include, at a bare minimum, the following: A set of dumbbells (adjustable or fixed), and a barbell with a set of plates. Beyond that, a kettlebell would be a perfect addition, along with a weight bench. We’ve previously discussed everything you need to know about building a garage gym including a full list of equipment that covers much more than putting together the best home weight set, so check that out if you’re looking to assemble a complete gym.